The Bonus Meter appears whenever it’s time to collect Floaty Rewards. 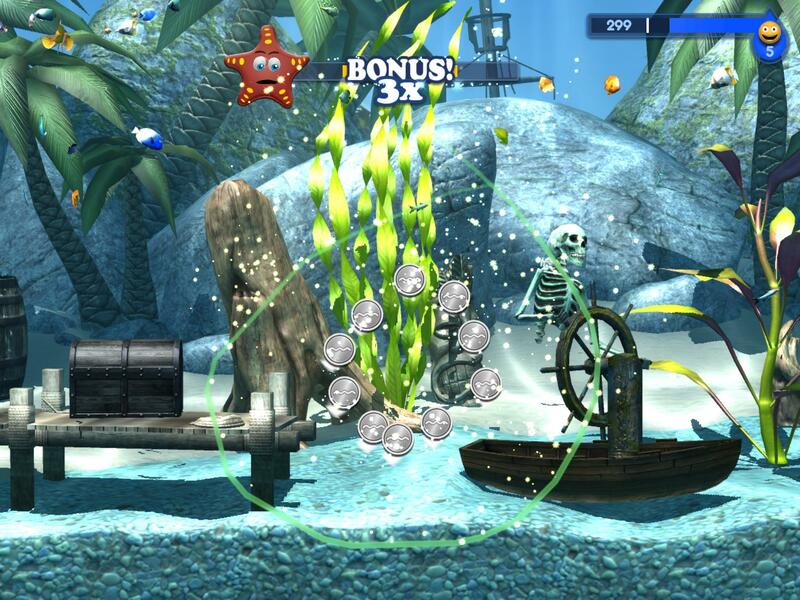 Many actions create Floaty Rewards, including selling fish, doing tricks, and selling items. Tapping rewards before the meter disappears increases your bonus payout – the higher the multiplier, the more TouchSilver you’ll get. There’s also a neat trick calling Lassoing. You can tap and drag Stewart the Starfish down from the Bonus Meter, and then if you draw a circle around rewards, it gives an even bigger bonus! The catch is that using a Lasso will then immediately cancel the Bonus Meter. So if you want the really big payday, be sure to tap rewards to keep the meter growing, and then when you think no more rewards are going to appear, Lasso the last ones! Don’t forget to take advantage of the Lasso in Minigames – you’ll need it to earn those 3 Superstar scores!